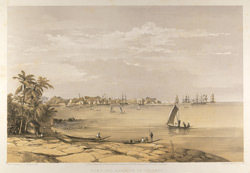 Lithograph by Jonathan Needham (fl.1850-1874) of the 'Fort and Harbour of Colombo' in Sri Lanka, dated 1st January 1864. This print forms plate 14 from 'A series of fifteen Views of Ceylon illustrative of Sir J.E. Tennent's work, from sketches made on the spot by Capt C. O'Brien, late Assistant Surveyor General, Ceylon' London, 1864. Part of the accompanying text reads, "Colombo, the capital of the island and seat of Government, has an interest as being the port from which nearly all the coffee and cocoa-nut oil is shipped for Europe...The view represents the Fort, with the Custom House, the Roadstead, in which are seen the large ships lading for Europe, and the 'Inner Harbour', in which are the coasting vessels and native craft. The view is taken from the suburb of Mootwall, the resort of the fishing boats; those formed of a single tree, with a washboard, supported by an 'outrigger' of light wood, attached to the canoe by two tough but light sticks [a catamaran: from the the Tamil 'Kattu' (binding) and 'Maram' (wood). ]..." Colombo became the capital of Sri Lanka, taking over from Trincomalee, and when the harbour was built in the 1870s also became the island's main port surpassing both Trincomalee and Galle both of which were natural harbours. Thre are two monsoons a year in Sri Lanka, the Yala season, which affects the south-western part of the island, from May to July and the Maha season which runs from December to January in the north-eastern regions.